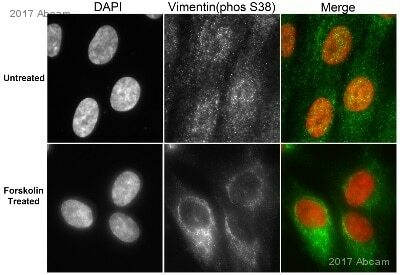 ab52942 only detects Vimentin phosphorylated at Serine 38. Synthetic peptide within Human Vimentin aa 1-100 (phospho S38). The exact sequence is proprietary. WB: HeLa cell lysate treated with Calyculin A. Our Abpromise guarantee covers the use of ab52942 in the following tested applications. WB 1/1000 - 1/200000. Detects a band of approximately 54 kDa (predicted molecular weight: 54 kDa). Is unsuitable for Flow Cyt,IHC-Fr,IHC-P or IP. ab52942 staining Vimentin (phospho S38) in the hTERT fibroblastsl cell line from Human by ICC/IF (Immunocytochemistry/immunofluorescence). Cells were fixed with Paraformaldehyde, permeabilized with 0.5% Triton X-100. Samples were incubated with primary antibody (1/200). ab150081 Goat Anti-Rabbit IgG H&L (Alexa Fluor® 488) preadsorbed polyclonal was used as the secondary antibody (1/200). Cells were counterstained with DAPI. Dot blot analysis of Vimentin (pS38) peptide (Lane 1) and Vimentin non-phospho peptide (Lane 2) labelling Vimentin (phospho S38) with ab52942 at a dilution of 1/1000. A Peroxidase-conjugated goat anti-rabbit IgG (H+L) was used as the secondary antibody at a dilution of 1/2500. Publishing research using ab52942? Please let us know so that we can cite the reference in this datasheet.